Reference: Neelemaat F, Meijers J, Kruizenga H, van Ballegooijen H, van Bokhorst-de van der Schueren M. Comparison of five malnutrition screening tools in one hospital inpatient sample. J Clin Nurs. 2011 Aug; 20 (15-16): 2,144-2,152. Epub 2011 Apr 28. PMID: 21535274. 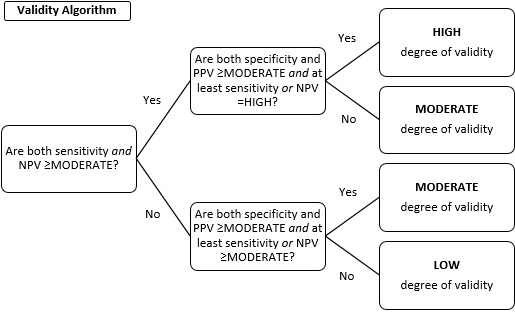 The sensitivity, specificity, PPV and NPV classifications were entered into the Validity Algorithm (below) to determine the OVERALL degree of validity of each tool. Sensitivity and NPV carried more weight than specificity and PPV in determining the degree of validity. Reference: Adapted from Table 3, Interpretation of Cohen’s kappa, in McHugh ML. Interrater reliability: the kappa statistic. Biochem Med (Zagreb). 2012; 22 (3): 276-282. PMID: 23092060.